I wrote this about three or four weeks ago. It occurred to me this morning why wait til she’s gone, write of her now, in the present, still here, with us, nearby me now lying on the floor, on her left side, to avoid pressing against the big ball of cancer on her right shoulder. Lately I look up more often from what I’m doing to reassure myself that her breaths still fill her lungs, to see the quiet rise and fall of her abdomen, the steady grace of her form. Her breaths are rapid but I’m not concerned it’s the cancer, she’s always breathed this way, every day since we first met over ten years ago now. She was two years old when Happy Wife (HW) rescued her; at least that was the estimate. Dogs don’t have rings like trees do so dating them is guesswork. Some people dislike the term “rescue” but in Lucy’s case she really was rescued. The women at the shelter were overjoyed when HW agreed to adopt her. By then Lucy was into her “extended” stay period and they feared if someone didn’t come for her soon… well, rules are rules, shelters have only so much room, new animals are arriving all the time and each of them wants a chance, too, complete with a photo on the website of their little supplicant face — Won’t you please adopt me? Meanwhile the Unchosen move further down the list, until, eventually, they scroll off the bottom. But that was not to be Lucy’s fate. Why of course, maybe one of Lucy’s special needs is Xanax! This was tried. But Lucy had a paradoxical reaction, Xanax made her even more anxious and restless. One time under a normal dose she began aimlessly darting about the house, jumped onto HW’s bed and without breaking stride leapt off the other side and flew head first into a dresser. This did in fact calm her briefly, and while you might say it was proof that the drug had worked, clearly it was not the way the drug was supposed to work, and in any case the effect was short lived — Lucy quickly shook off the collision and returned to her nighttime expressions of anxiety. Eventually her anxiety was brought under control by amitriptyline and she matured into the biggest bundle of sweetness you can imagine. Even still, in the early years there were times when I grew frustrated because a bathroom or bedroom light had to be left on overnight because Lucy was afraid of the dark and needed a safe place to sleep. It was at these times when HW would calmly remind me of what her mother had said. Just now she got up off the floor and walked over to me, standing next to my chair, looking up at me with her soulful eyes, wondering if it wouldn’t be too much trouble if I could pull away from my writing for a few seconds to let her out the door in the backyard to pooh, and then I’ll just curl up in a little ball in the dirt right here beneath the window, me and my cancer, where you can keep an eye on me if you care to. I won’t bother you the rest of the day, Papa. Promise. And I want poke myself in the eye with a sharp stick for Every Single Time I ever complained about a light having to be left on overnight. I open the door for Her Grace to let her out. I give her two chicken treats, her favorite. As many as she wants, as often as she wants. One of the drugs we give her (prednisone) has made her ravenous. We don’t give her drugs to get rid of the cancer, that’s futile now and has been since we conceded months ago the disease was systemic, merciless against our many tries to get rid of it. No, she’s in hospice now, chicken is palliative. We give her the drugs to reduce the cancer’s symptoms, to keep her as comfortable as we can for as long as we can. I think it was when the four of us — HW, I, Rufus & Lucy — went to Cleveland for four years that I started calling her Lucille. 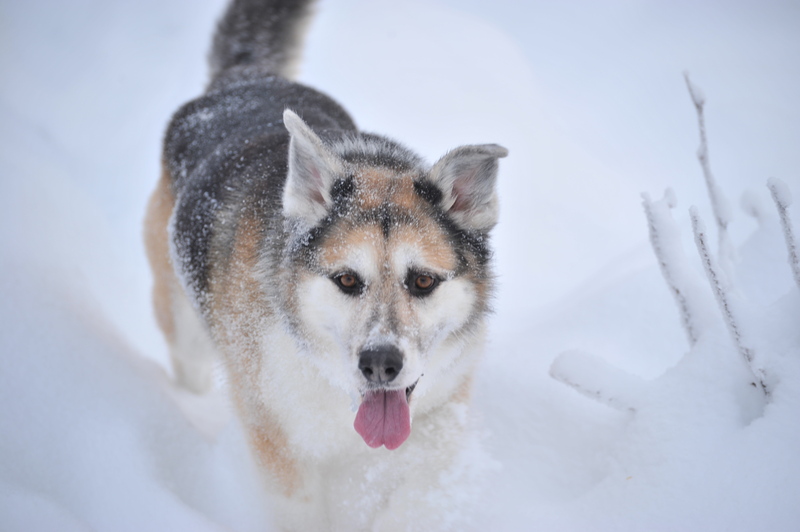 That, or The Streak, for the way she could move through a dense woods, leaping over dead fall — you’d see nothing but a flash here and there of the white and brown markings of her incomparably beautiful coat as she chased down a white-tail deer, merely for the fun of the chase. And her coat and markings really are beautiful, it’s the feature of hers most often mentioned by strangers who stop to comment on how pretty she is. We’d laugh because in the same amount of time it took Lucy to chase after a deer a mile or more and return to us, Rufus was just getting his first olfactory alert — Deer! If it is true dogs can be good friends, those two were, without question. Never fought once and they always hung together, even when it seemed they were lost without hope. When we left the house for work in the morning, they stayed in the house together, always. One day a violent thunderstorm passed over East Cleveland. I’d left a kitchen window cracked open before I left for work, maybe a couple inches from the bottom, mostly owing to the futility of trying to close the damn thing — with the countless coats of paint on it, it was almost impossible to move up or down. We later guessed a series of violent thunder claps came so low over the house that they must have sounded like they went off in the attic, and if Lucy has special needs there’s also one thing she doesn’t need — sudden, loud noises. So when the storm came in low and the thunder cracked she probably panicked. When HW got home later in the afternoon and walked in the house, no Lucy, just Rufus. In her mad sweep of the house to locate Lucy she happens to look out the window in the backyard. There’s Lucy, standing in the pouring rain, drenched — and I mean drenched — fur flattened to her skin and looking skinny as a mud puppy. In her panic she’d gotten out of our house somehow, ran into the neighbors’ backyard where the grandmother spotted her out the kitchen window, alerted her daughter who thankfully recognized Lucy and kindly got her on a leash and put her in our backyard (fenced). But how had she escaped the house? I get home and HW tells me what happened, and then I see the kitchen window — you know, the one a grown man could not force up or down? — open maybe six inches with a gaping hole in the screen behind it. To this day I’ve no explanation for how she could have forced that window open that far and have managed to squeeze through the gap and push on through the screen. Special needs. Special powers. I’m looking out the window now but I don’t see Lucy. It’s early September, a partly sunny day, pleasantly warm for this time of year. She’s probably curled up in a little dignified ball of white and tan at the base of the currant bush, a shaded refuge from the sunlight flickering through trees. Weird, isn’t it; she’s afraid of the dark but will seek it out at the first sign of flashing light, or even at what she’s learned causes it. Pull a camera from your pocket and she’s running for cover. The final homecoming in Anchorage was in 2009, the four of us variably satisfied for having done the Cleveland thing. It felt good to be home. The four of us did the drive together as far as Seattle and never once did either dog complain. We put HW on a plane and the three of us drove the rest of the way to Anchorage, Lucy riding shotgun. She laid on a raised platform that HW had rigged up for her on the passenger seat, composed of a scrunched up dog bed, a sleeping bag, and blankets. She laid on that with her head resting on the dash, her nose pointed toward the future you might say, and would stay that way for hundreds of miles. Many a dog’s virtues capture my envy, patience and calm not the least among them. Lucy had both in spades, except, of course, in the dark. She’s been the steadiest of companions always, but especially since we returned to Alaska. The rivers and lakes and streams and mountains are like one big dog park up here. No fences, no areas designated for big dogs versus small, no playtime rules to abide, just boundless spaces in which to roam with our four-legged friends wherever, whenever, and however we want. Spring summer winter and fall. If there’s a finer expression of freedom I don’t know of it. There was a time after Rufus left us but before Harry arrived when our walk in the morning at the park was just Lucy and me. 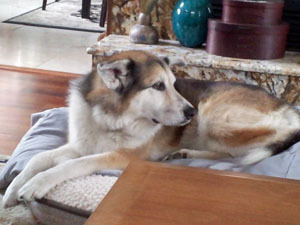 You never want to admit to favorites but she really was the finest canine companion I’ve ever had. Independent, fearless, friendly without exception, always close by. It seems like a simple thing, a walk in the park with your dog, but I can assure you a great deal of therapy occurs, too. For that I am especially grateful for the steadiness of Lucy’s companionship. I wonder what will be left when she’s gone. Like losing a right arm I suppose. The pain of absence will arrive as phantoms, memories of presence which cannot be unlearned. Like when Rufus died in ’12, for too long I heard his bark in the backyard and turned expecting to see him. It will be no different in kind when Lucy goes to the Rainbow Bridge. But believing she is there, cancer free, with Rufus and all the other dogs that have graced our lives, I hope will help to chase away the phantoms. Coda: Saturday, September 27th, 2014. Lucille passed today. She’d finally succumb to the cancer. HW and I knew it was time when her legs failed her and not a trace of spirit was left in her eyes. The emptiness in our house is as big as the hole in our hearts. Godspeed, our sweet girl, godspeed. Your first sentence should have been “She called me Papa”. That’s how you always referred to yourself and how she thought of you. It wasn’t until she and I found you and Rufus that her anxiety melted away to something that was easily managed with a nightlight. My life is better for having been her mom. You will always live in my heart my lovely one.